Manitowoc, WI- VitroCleanTM Green crushed glass filter media is manufactured from recycled, processed glass and is a direct replacement for silica sand and other materials in media filters. VitroClean offers you the safest, most reliable and cost effective way to upgrade your new or existing sand filter system. Designed to work in existing sand filter, VitroClean Glass Media will filter finer than sand with 20% less media required. Unlike sand, VitroClean media has a non-crystalline shape offering less density and more open space between grains to trap fine particulate. Because it is crushed glass, it does not degrade like sand, allowing for a greatly reduced need for replacement due to degradation of the media. Even though it is made from crushed glass, VitroClean media is safe to handle, with no jagged edges. Contact DRAMMwater to learn how VitroClean can improve your water quality while lowering maintenance and replacement costs. 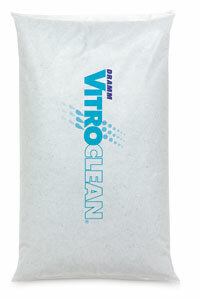 VitroClean is available to the horticultural industry exclusively through DRAMMwater. For more information on the DRAMMwater, VitroClean or Depth Media Filtration, please contact Al Zylstra at Dramm.